DID YOU KNOW THAT BUFFALO BILL CAME TO SALFORD, AND THAT SOME SIOUX STAYED AND MADE A LIFE HERE? Be at the world premiere of John Ludden's new play "Once Upon A Time" and explore this fascinating story through performance and music. Also part of this great event is Salford poet JB Barrington and musician Jess Kemp. 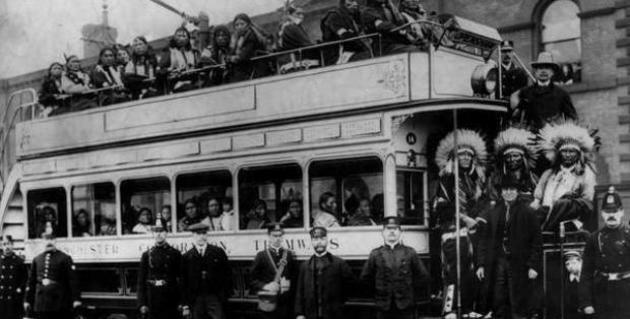 Once upon a time in Salford is a short play relating the astonishing tale of the Salford Sioux. Arriving with Buffalo Bill’s Wild West circus back in 1878, we tell of a trio of warriors who settled in Salford and never went home. Charging with Thunder, Black Elk and Surrounded by the Enemy. A moving story of three men, immigrants, so far away from their own environment, they could have been on another planet. From the vast plains of Dakota and the beautiful star filled nights, to the billowing smoke, chimneys, and blacked out sun of a dirty old Town…. Directed by award winning director Simon Naylor who runs Manchester's 53Two Theatre. John Ludden is a highly experienced author from Manchester. He has written over twenty books and been published in four separate languages. John’s work includes chronicling the history of Manchester United with the highly acclaimed A tale of Two Cities: United Real Madrid: 57-68. This is set to be made into a forthcoming documentary. Also, his now cult classic Maradona: Once up a time in Naples is currently the major basis for a film by Oscar winning director Asif Kapadia to be released this summer. Aside from sports books, John has written a host of well received novels and factual works. His last book told the story of the legendary Collyhurst and Moston boxing gym. There is a light that never goes out: Once upon a time in Salford is his first stageplay. JB Barrington is an award winning performance poet. JB's poems are about portraying life as it really is through the lives of the working class. This is a great opportunity to see one of the countries most powerful performers on the UK circuit in a intimate setting, back in his hometown of Salford. Some reviews of JB's work.... "Lovely stuff; touches heart-strings and the odd raw nerve" - Johnny Vegas “Savagely funny and profoundly moving” - Cheltenham Poetry Festival "Great poetry, absolute class" Steve Cradock (OCS & Paul Weller) "A warm charm, a rapier wit & a real appreciation of words" - Louder Than War "JB is an important artist in expressing contemporary poetry" - Vini Reilly (The Duritti Column).